This is something I hear often: it's too nice to use. Nooooo! Use your book! Treat it badly! Hold it to you tightly, spill tea over it, spray it with perfumes, slice through your pages with holes and tears and cuts. 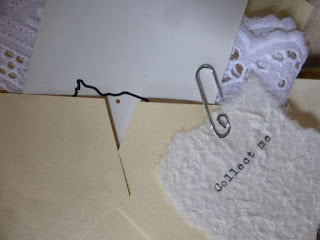 Sew up the pages, wrap the book casually with rubber bands and bootlaces, then shove it in a bag or a drawer, perhaps even your knicker drawer. Now you have properly entered the community of Knicker Drawer Note Bookers. These lovely, wondrous people use their books as part of living. They catch ordinary journeys, make everyday notes, stash away memorabilia, photographs, slips of paper. The more the books are used, the more distressed they become, and the more an expression of You they take on. How unique a creation you have made. So please, don't let your book stay idle, unused. Treat it well or badly and, as you go, simply enjoy the process and practice of creativity, no guilt about mistakes, no errors, no regrets; just a simple becoming. Here's the ideas sheet I slip into every book. Really, it's just a start. There are many ways you can catch the ephemera of everyday, whether you need to jot down a passing thought; keep a memory; love a billet-doux; collect a ticket from a special day; save a hand-written receipt for an item you treasure; keep a photo; store a recipe or a cutting, or hold for the future a simple scrap of paper written upon by someone you love. Use some of these techniques to hold your treasures beautifully. Pin your item to the pages with safety pins, dressmaking pins, craft pins, hat pins. 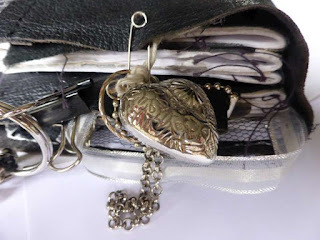 Dangle earrings, charms and found objects from string, chain, or ribbon tied to your book. Glue papers, tickets, photos and scraps with firm glues, or use liquid glues to wrinkle the paper. Stick masking tape, double-sided tape, clear tape, or decorative washi tape to the page. 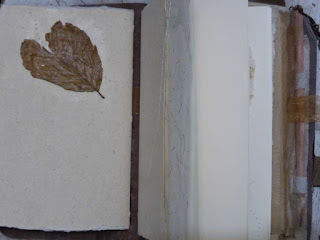 Press flowers, leaves, roots, grasses between your pages. Use pencils to draw and shade pages or pattern your book with doodled lines. Repeat a pattern through the pages. Try date stamps and decorative stamps. Staple items with coloured staples. Clip papers together with bulldog and paper clips, hairgrips or tie pins. Fold and stick pages together to create secret pockets. Add pages by gluing, sticking or stapling concertina or fan-fold papers into your book. Sprinkle glitter, bath salt, or sand into your book's pages. Stain and wet pages with diluted inks, diluted paints or tea-bags. Tuck envelopes, letters, and folded pages inside your book. Weave papers together, or cut pages to insert and hold items. Use photo mounts, or blank photo frames. Put scraps of fabric inside your photo frame. Crumple, tear, or wrinkle pages to create texture and sound. Paint the edges of your papers. Drop ink splatters over your pages; fold the pages to make blots and patterns. Add transparent layers between pages. 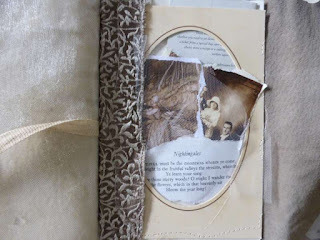 Stitch pages together, or stitch items straight to your page. Tie pages together with ribbons, embroidery thread, rafia, twine, and braids. Glue unusual items into your book like handbag mirrors, false eyelashes, or sewing threads. Add index markers, labels and thumb tags. Leave threads hanging to attach beads. 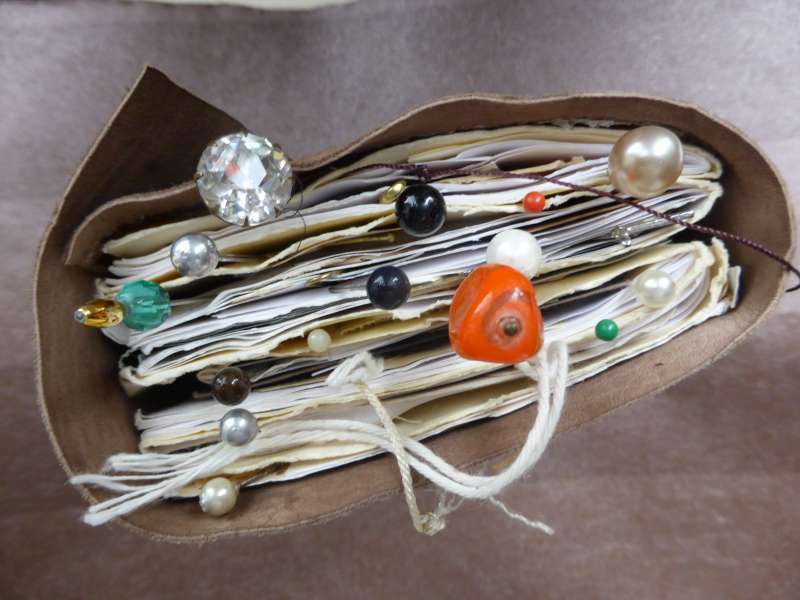 Enclose objects inside your book: bind them to the book by string and ribbon. Punch holes in the leather covers to stitch and pin objects. Use chains, wires, metal links and loops to attach items to book covers and bindings. Stitch in nets, felts, ribbons, cloths on which to sew and pin. Cut or prick pages decoratively to leave attractive shapes and swirls. Tear holes in the pages to see through the book. Stain and fragrance pages with paints, flowers, oil-based perfumes, waxes and soap flakes.